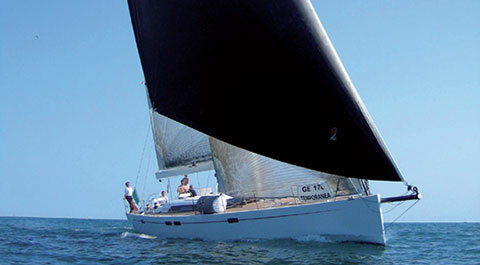 OneSails produces sails and accessories designed and developed especially to suit the needs of discerning owners who are looking for modern and functional technical solutions that improve sailing performance and enjoyment. The OneSails range of products is designed specifically with cruising in mind for boat owners who strive for the ultimate combination of performance, durability and aesthetics from their sails. R&D are two driving principles of the OneSails philosophy, a spirit which does not stop at the design of innovative products such as Vektor2™ and 4T FORTE™ but permeates all the phases of sail design, ongoing development and its application. OneSails has a range of products to suit every end use and budget including woven cross-cut and tri-radial panelled sails and a range of custom membrane style products that includes Vantage1™, Vektor2™, M3™ and 4T FORTE™. These exclusive products featuring continuous fibre paths allow us to build mainsails and genoas that are relatively light when compared to other similar products, yet which remain durable and easy to trim with performance well beyond that which can be achieved with more traditional panelled alternatives. All sails, regardless of the construction type are customized to suit each boat and each owner’s requirements and incorporate the highest quality components in order to guarantee the maximum level of performance over time. 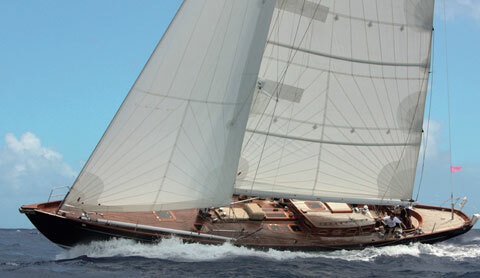 OneSails woven cross-cut sails are built using only the very best quality premium Dacrons. 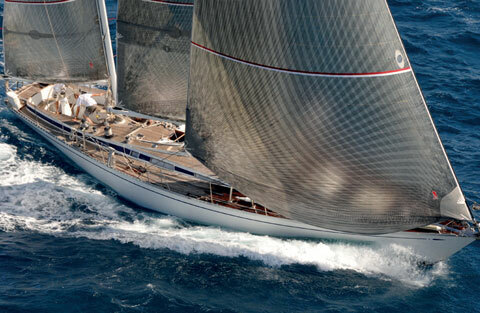 All Dacrons are not created equal; OneSails are particularly stringent when it comes to cloth selection in order to ensure that each piece of cloth is perfectly suited to its intended end use. Tightly woven high tenacity yarns with built in UV inhibitors combine to offer the most durable sails on small to medium sized boats at the most affordable price. Tri-radial construction creates a more sophisticated means of distributing the loads in a sail than can be achieved with a cross-cut sail. 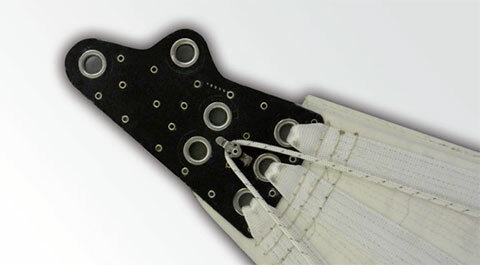 Higher tech fabrics including Dyneema reinforced fabrics such as Hydranet and a range of dedicated cruise laminates will offer better shape holding and hence improved performance and handling than cross-cut alternatives. OneSails offer distinct laminate membrane style sails, plus a novel filmless composite construction, each dedicated to cruising applications. 4T FORTE™ differs from the other membrane styles in that it is a composite construction rather than a laminate. 4T FORTE™ sails incorporate the latest high modulus fibres but without mylar films and adhesives that characterise laminate constructions. Using a multi micro layered structure, the elements of the membrane are fused together resulting in a stable, stretch resistant and durable sail. By eliminating mylar films and adhesives, these sails are significantly lighter than the laminate alternatives, particularly in cruising applications as 4T FORTE™ membranes do not need to be covered in heavy woven taffeta’s to improve durability. 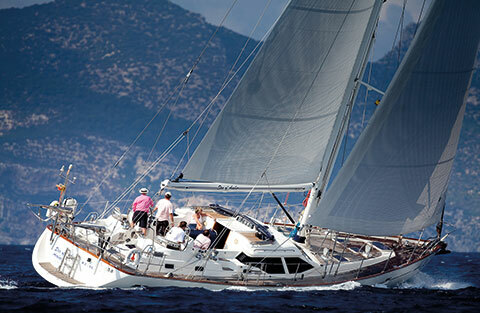 M3™ is perhaps the best continuous yarn technology available for high performance sails. Using continuous high modulus fibres, the ‘resin free’ lamination process creates sails which are highly stretch resistant, yet are soft, flexible and which represent a major advance from other ‘mould production’ sail technologies. The use of heat and pressure in a controlled environment causes the special polymers that are incorporated into the films to fuse together in an irreversible process without using adhesives. The addition of a single or double sided taffeta toughens the membranes, improving their durability and making them suitable for performance cruising applications. 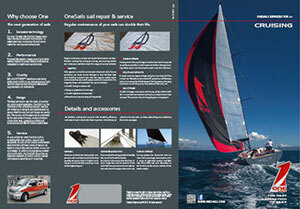 M3™ sails are delivered with a three year warranty against delamination as standard. Vektor2™ is the culmination of more than 20 years of development in the construction of sails incorporating continuous yarns. The continuous fibre grid is comprised of reinforced fibre tapes applied under high pressure to the film that constitutes the sail. 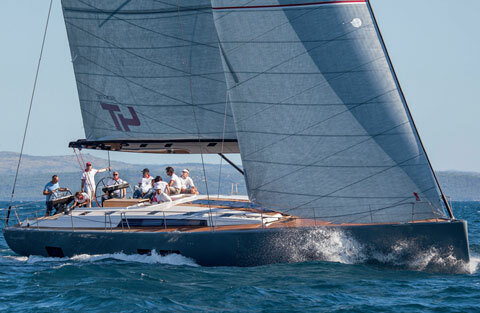 Unlike similar products in the market, the unique tapes used in Vektor2™ maximize the structural capability of the fibres without restricting the fibre layout which in turn means excellent shape holding in all areas of the sail. 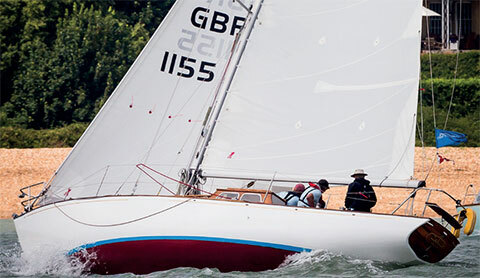 Vektor2™ is available with several different fibre styles and allows access to continuous yarn technology (a one piece sail) at competitive prices when compared to traditional panelled sails means excellent shape holding in all areas of the sail. Vektor2™ is available with several different fibre types for the structural grid, the very latest innovation introduced exclusively by OneSails being the use of Dyneema™. 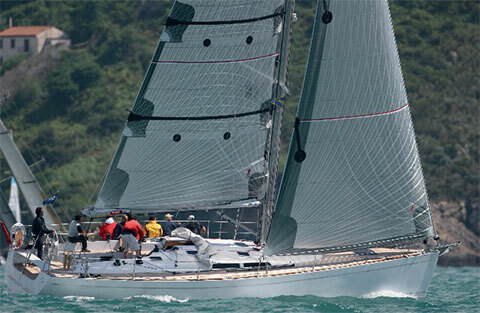 This guarantees characteristics distinctly superior to Aramid fibres both in terms of durability and performance and allows access to continuous yarn technology (a one piece sail) at competitive prices when compared to traditional panelled sails. Vantage One™ membranes feature complex arrays of curved fibres that distribute loads evenly across the sail reducing localised distortion and improving overall shape retention. The sails are laminated in sections before being cut, shaped, and joined into the final one-piece membrane. Although the fibres are discontinuous across the seams, the fibres are arranged in a way that ensures continuity of load distribution. The stringent lamination and shaping process results in efficient, easy to trim, durable sails with precise shaping and minimal shrinkage or distortion. In order to cater for different budgets and end-uses, Vantage1™ membranes are available with a variety of fibre arrays and finishes that makes them perfectly suited to performance cruising. All OneSails cruising sails are built with durability, efficiency and ease of use in mind with these important criteria being as valued to the day sailor as those undertaking more ambitious blue water passages. 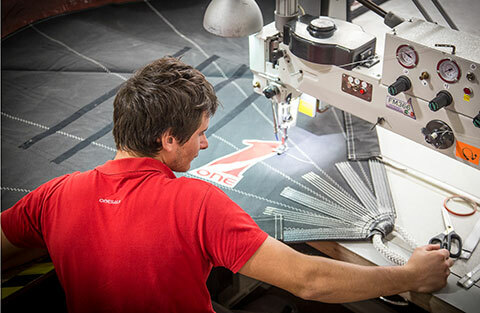 Attention to detail, the best quality components and a real desire to build the best possible sail means that all OneSails cruising sails are intrinsically rewarding to use to the highest degree. Downwind sail handling can be facilitated by the use of the OneSails Snuffer. An internal tube means that the lines remain tangle free and the material of the sock itself ensures minimal water absorption and ease of stowage when not in use. 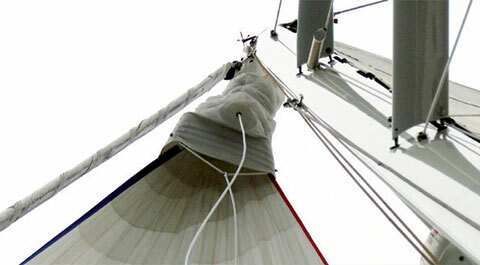 Furling systems for downwind sails are also now increasingly commonplace with a range of dedicated systems available that allow FFR’s and even Gennakers to be furled from the relative comfort of the boats cockpit.